Applying for BDO Internet Banking is now easier and hassle-free. 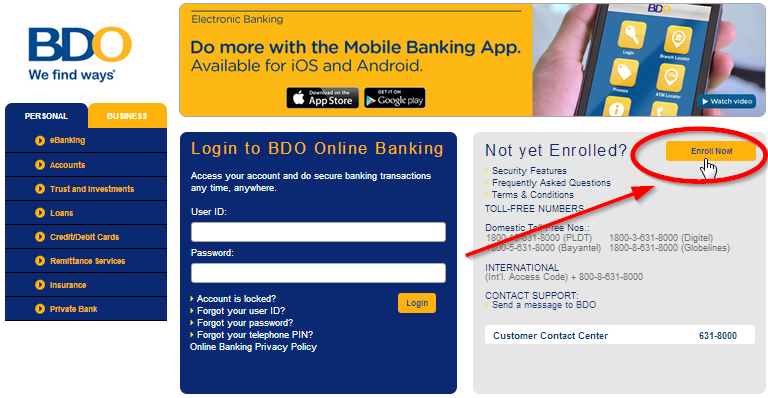 If you have a BDO ATM, then you can automatically enroll for BDO Online Banking. Here are just some of the great features of BDO Internet Banking. Ability to check your account balance 24/7. Ability to view the transaction history of your bank account. You can pay your bills online. You can transfer funds online. Just follow these simple steps for BDO Internet Banking Enrollment. 1. Visit https://online.bdo.com.ph and click on Enroll Now! 2. Read, Accept the "Electronic Banking Terms and Conditions" and hit Submit. 3. Fill up the Online Enrollment form. Before entering any details, make sure to read the guidelines listed at the upper left portion of the enrollment form. For Savings and Current Accounts, an ATM card is required. If you do not have an ATM card, please visit your branch to request for one. Other BDO accounts like Time Deposits, Cash Card, Consumer Loans and Trust Account may be enrolled as additional accounts once you have activated your Online Banking. If your account is eligible for online banking, then continue filling up the enrollment form. Choose an account to enroll. Enter your desired User ID and password. Select two challenge questions, and enter your mobile number and email. Now, key in your ATM Card Number and the 12 digit Account Number. Select the account type and enter your preferred Nickname. Lastly, enter the validation code shown in the captcha image to prove that you're human and not just a spam robot then hit the Submit button. 4. Copy the Activation code. Once you're done with the form, BDO will send your activation code to your email address. You may also get it by simply copying the code from the acknowledgment page. Visit any BDO ATM machine within the next 45 days after getting the activation code. To activate, just choose OTHER SERVICES select ACTIVATE INTERNET BANKING and enter your ATM Activation Code. If you've followed the steps correctly, you will receive an email confirmation of your approved BDO Internet Banking application. After receipt of the notification, you may start accessing your account and do banking transactions 24-hours online. That's how easy it is. If you want to be free from the long lines and queues at the banks and payment centers then you may want to enroll for BDO Internet Banking. 82 comments on "[BDO INTERNET BANKING ENROLLMENT] Experience Hassle-Free Banking 2017"
No worries. This new BDO Internet Banking Enrollment process is much easier than the first one. I hope you're able to activate your account or your mom's. Hello Joyce, I already encoded the activation code to ATM machine, how long does it take to activate my account? Thanks. Hello! 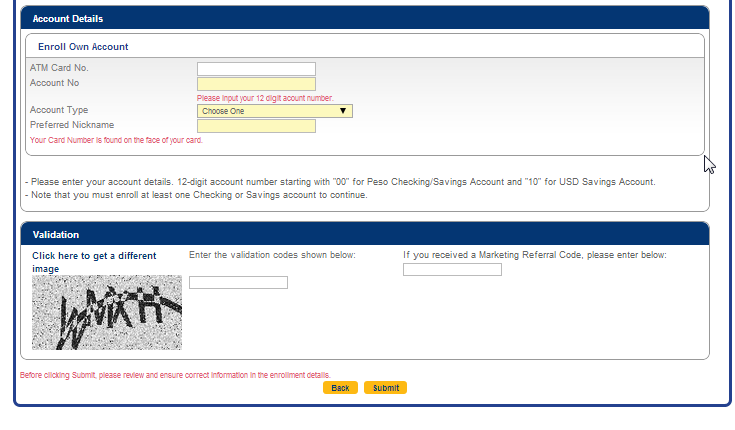 I'm trying to enroll my bank account for BDO's internet banking but it says that I have to enter a 12-digit number. I added "00" before my account number already but I lack one more. My account number has only 9 numbers. What do I need to do to complete my application? Hi, i have the same problem as Chiara Maria. My account number has only 9 numbers, why does the system ask for 12 digits? i hope you can answer this. Thanks! I don't understand why they asked for 12 digits of atm debit account number if i only have 8 digits of account number'me i know why is that? Just add 0 to complete the digits..try and try it happen also to me..
Hi!When i was about to fill up the form,i had also encounter the same problem,after i got the error, the form states that the account number is started with two zero's but i realize even i will add two zero's there's still missing because i only have 8 digits of account number until i tried to add another two zero's again and it works. Finally!I got an email from them with ATM ACTIVATION CODE. Thank you so much for posting this joyce!It helps a lot. Arrah is right, just add zeros at the beginning of your account number to make it twelve. The one that I was able to enroll before was a 10-digit BDO account number, I just added two zeros and it worked. I didn't know that BDO doesn't have a standard number of digits for all of their accounts. I have a 16-digit card number on my ATM Debit Card. When I try to enroll it, it wouldn't go through. Why is that? Maybe you're trying to enter it incorrectly or you're entering it in the wrong field (interchanging the ATM card Number and the account number). The 16-digit ATM Debit Card number should be entered in the first field of the Online Enrollment form, while the account number should be entered on the second page of the Online Enrollment form right after you hit next. hi joyce, just wanna ask... what will happen if you cant activate it within 45days??? can i register online again??? will it be blocked??? Hello there, I honestly don't know what will happen if you're unable to activate it within 45 days. Maybe you can try to register and activate your BDO ATM card again. But why wait after 45 days? It would be best if you activate the ATM card as soon as you've registered it online. Hi! I activated my online banking last tuesday, and i checked today Thursday, it says its still pending. I haven't receive any email. Hi Joyce, thank you for the post it's very informative. I tried to register an account but I didn't get to see a pop up like the one on step 3, instead it loads the registration form. Still I fill it up and at the end I didn't get an activation code. Any advice on that? I really want to activate it within 24hrs. You may have forgotten to enter the ATM Card No. The system will only generate the ATM Activation Code if a card no. is entered. It can be found on the face of the card. You can go to https://online.bdo.com.ph and log in with your UserID and Password. You will be directed to the Enrollment Status page. Scroll down and you will see a button to reprint the online form. doon po sa account details meron pong ca pin( cash advance pin) para saan mo yon and meron po bang bayad if kukuha ng ca pin ? 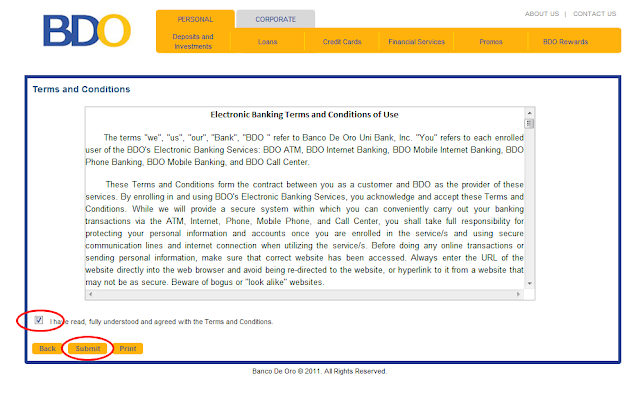 Just wanna ask if you still need to submit your signed Electronic Banking Form to any bdo branch. It depends on your answer to step number 3. If you have access to a BDO ATM near you then there is no need to submit a signed Electronic Banking Form to any bdo branch. Just follow the steps listed above. Otherwise, you must submit your signed form to YOUR BRANCH OF ACCOUNT (i.e. the BDO branch where you applied for your account). How will the activation take once I have done step 5? I meant how "LONG" will the activation take. If you've followed the steps correctly, you will receive an email confirmation of your approved/activated BDO Internet Banking application. Check your email account for an email notification sent to the email address that you entered in the Client Information. You can check it after 24 hours. You can try to see if it works but I haven't really tried adding more than 1 account. This is actually a good question, you might want to send an email to BDO here - https://www.bdo.com.ph/contact-us. Takes them around 24-48 hours, but they do respond. If you encounter the "Site Under Maintenance" page, it is pretty common with BDO. Chances are, you email was still sent. Wait for the "noreply" message in your email; this confirms they have received your query. Otherwise, you may call BDO at 631-8000.
i am using BDO corporate internet banking... yesterday afternoon it was about 5:00pm i was able to log in, and view my transactions and just this early morning when i about to log in using my current password, corporate id and user id... the reply is always log in invalid? i am using this website https://www.bdo.ph/cib/fo_cib_login.jsp everytime i log in... could you help me how to log in back to our account? hoping for your immediate response..
Hi there, I may not be able to help you regarding BDO corporate accounts, I can only speak for a customer with a personal savings account because that's what I have. Hi Ms. Joyce - your blog is very helpful. But I want to ask: my ATM was issued for a savings account. But I have another checking account in another BDO branch which I do want to access online. May I use the ATM card number of the savings account to enroll the online banking for the checking account? Hope I did not confuse you :) I myself am..
Hi Mercedita, I understand that you want to enroll your checking account for online banking, but it doesn't have an issued ATM card right? So you're asking if you can use the ATM card number from use savings account. Unfortunately you cannot do that because these are 2 different accounts. Also, BDO checking accounts aren't accessible online. Here's a list of BDO accounts that are accessible through BDO Online banking. You can enroll your regular savings account. but not the checking account. Hope that helps. hi ! I couldn't find my account number in my BDO ATM Debit Card. Where is it located?? thanks! Hi joyce....would it be possible for me to transfer funds from my Savings Dollar Account to my mom's Peso Account? I find it hard to transact from my dollar account....like i can't buy load for my mobile phone using bdo online banking! Please help.....thank you! would it take my account to be validated? shall i wait 24hrs before typing it again on an ATM? How to add more accounts under 1 user? I don't want to enroll again. I can't seem to find any tutorial on this..
Enrollment Services > Own Account > Enroll. days on weekends and holidays." 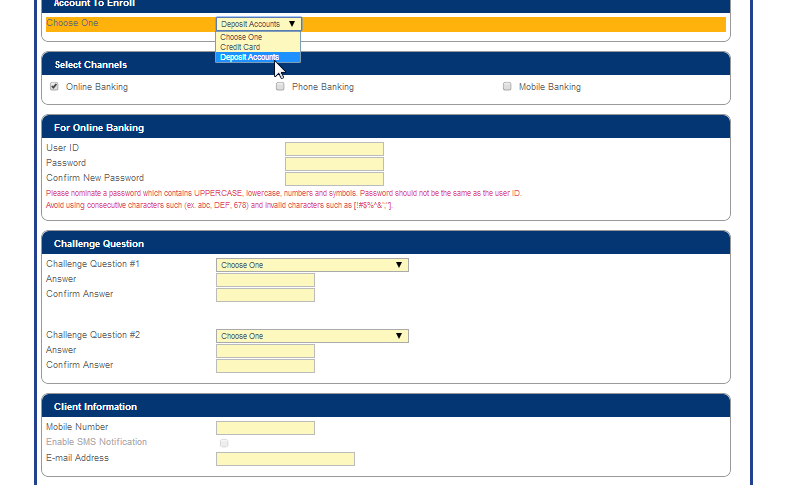 Meaning, you can enroll other accounts under 1 UserID after you have successfully activated your online banking. Just log in and follow the instructions under Enrollment Services. Good day Joyce. Is there a way to activate online banking if you're in abroad? 1. Go to any BDO ATM. 2. Press “Other Services” button. 3. Select “Activate Electronic Banking”. 4. Enter ATM Activation Code then press “Confirm” button. hello, do you know guys whre can I find the -10 digit phone banking number? thank you! Hello! Where can I find my account number? The only one I have is the 16-digit ATM number. I hope you could help me on this. Thanks! Your Account Number is a 12-digit number, which can be obtained by calling the specific BDO branch where you applied for the card. When I called my BDO branch, they originally gave me a 10-digit number. However upon enrollment, the online form will ask you to enter 12 digits. Simply pad "00" for a PHP account or "10" for a USD account. This is also stated in the enrollment form in the ACCOUNT DETAILS section. Hope that helps. My Aunt has 12 digits savings account number starting with "10" (meaning, dollar acct). Can she remove the first 2 digits so she can able to send dollars from US (WellsFargo) to Ph (BDO)? WellsFargo is asking for 10 digits only so they (she and her daughters) having trouble on sending money because of these digits. While the general process can still be outlined from this article, it has changed a bit since it was written back in 2012. Because this is one of the popular articles about the subject, it will be a good time to update it to reflect these changes. 1) To be exact, the website is now https://online.bdo.com.ph, although your posted link re-directs to that address. 2) STEP #3 is no more. After submitting the "Electronic Banking Terms and Conditions of Use", it will go straight to the Online Enrollment form. The form had a few changes as well, so you might want to update the screenshots too. 3) Since there is no more STEP #3, ensure to enter the ATM Card No. in the Account Details section of the form (if you have an ATM card); this is in essence equivalent to the "first option" in your original STEP #3. If no ATM Card No. is entered, this is equivalent to the "second option". For the 12-digit Account No., it matters whether you pad "00" or "01". 4) The last 6-digits of the Transaction Reference Number is NOT the ATM Activation Code. If the ATM Card No. was entered correctly, the Acknowledgement page will give the applicant BOTH the Transaction Reference Number and the ATM Activation Code. These will also be sent to the applicant's email. NOTE: The system will NOT generate an ATM Activation Code if there is no ATM Card No. entered. If the applicant fails to enter his/her ATM Card No. upon initial enrollment, only the Transaction Reference Number will be generated. In this event, the applicant may simply re-enroll under a different UserID, enter the ATM Card No. and the Account No., and the system will aptly generate the code. Hope this proves useful to everyone. Enjoy online banking! Thanks for providing the updated info of the enrollment process. This will surely help the newer users. I've updated the article. Hi can I close my account even if I am enroll sa ebanking ? Yes, I think so. You may contact BDO to be sure. done to fill out and How can i get my ATM Activation Code? Hello do you have any idea how many days will my online banking activated after activating it through atm machine...I have recieved the confirmation email already right after activation but until now, its been 2 weeks already, when I log in it still says enrolment is pending.do you have any ideA? i got the same problem how did you fix it ? Helo ma'am, I lost my atm card, the replacement of my atm takes long. Now, i want to register online banking. But sad to say, i dont know my atm card number. How can i get it. Please help me. Thank you..
hi joyce. i'm having problem registering my ATM Debit card. when i try to submit it has a message of non numeric. and where can i find the marketing referral? thanks. Try not to fill-up the marketing referral, it's just optional. My problem is that i have enyered a wrong digit of my phone number when i registered at the bdo website. Now i.cant receive otp for app activation. What do i do? TIA. Go to your account summary on the top most choice in the left pane. There should be an option there where you can edit your contact details. is there any option to change my username on my BDO online banking? I am trying to reset my password but still there is no link or temporary password sent to my email accout.is there any other way to reset my bdo online account? Hello ms Joyce! What is i didnt activate my account in bdo atm? Hello ms. Joyce. How can i get may marketing validation code? hi mam Joyce,,,i already enroled in bdo acc,,,but still pending po,,,,somebody called me from bd0 after the day na mg enrol po aq f0r verifications,,,,but on the same day,,,i went out p0 & l0st my phone. at d m0ment im staying here p0 sa kuala lumpur,,,i wanted t0 change d contact number that i input b4,,,,s0 paan0 p0 mam??? hoping for ur kindly reply! hi mam joyce ask ko lang po kung bakit hindi po sya maregister sa online banking?? invalid card number lumalabas..? Hi, Paano kung nakalimutan ilista ung activation code? Hindi ko rin kasi madelete ung inadd kong account, wala naman option to delete. Hi ma'am, I applied for a BDO account and they gave me a debit card with no passbook. I've tried withdrawing money from it already and it's successful. Three days ago, I enrolled in online banking but it got rejected. When I tried viewing my balance on my atm card on a BDO atm machine, I was not permitted to do so.It was like my account was deactivated?